The significance of duodenogastric reflux (DGR) in the pathogenesis of gastric ulcer disease is still uncertain. Much of this uncertainty arises because the complex process of reflux has been studied in many different ways and usually only one aspect or marker has been measured at a time. This limits the value of comparisons between DGR measurements by different workers. Although various duodenal constituents, particularly bile acids, have been shown to damage gastric mucosa in experimental studies, great caution is required before results of such animal experiments are used to implicate DGR in the aetiology of human gastric ulcer disease (GU). 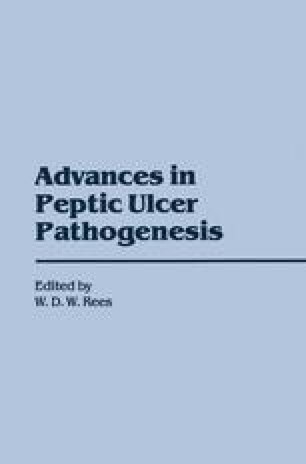 In this chapter the evidence from human and animal studies which suggest that DGR can cause gastric ulceration will be reviewed. The motor abnormalities in gastric ulcer disease which could predispose to reflux will then be considered.